You can use the Dare to Dream movie as a way to build club membership and get terrific PR for your club and for Rotary. This is in addition to raising money for Polio Plus and substantially leveraging the value of your polio contribution over and above just buying the film. Membership: Dare to Dream is a story about Rotary leadership. Potential new members of your club will be amazed at the scope of Rotary’s involvement in eradicating polio, and equally impressed with our stature as a partner to the WHO, CDC, UNICEF, and the Bill and Melinda Gates Foundation. What better way to introduce someone to Rotary than to show them an engaging film in a comfortable setting? Be sure to invite prospective new members to a movie night at a member’s home. Membership Retention: Most Rotarians don’t know the amazing true story of how Rotary decided to eradicate polio. The film is meant to educate, motive, and inspire current Rotarians which means more member involvement in your club, more understanding of why it is important to be a member of Rotary,and of course, why giving to the Rotary Foundation’s Polio Plus campaign is so important. 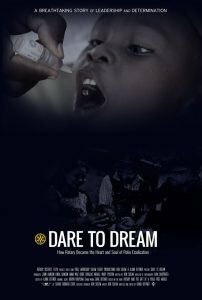 Public Relations: Dare to Dream offers an excellent opportunity to reach out to the community to explain about Rotary and about our efforts to eradicate polio. As we near the last case of wild poliovirus, it is important that Rotary clubs plan to leverage the avalanche of national news that is sure to follow in order to benefit their own club. Showing a movie is a wonderful way to explain Rotary and improve community awareness in an entertaining way. Additionally, the next generation of Rotarians is highly focused on international service. From their more global view of the world, Rotary’s engagement with polio eradication is a strong selling point for Rotary membership. Ask members to invite NON-ROTARIANS who might be potential membership prospects or potential donors to the Rotary Foundation to attend. The guests can be family, business associates, neighbors, or anyone else that your members think might be interested in Rotary. Or, anyone they think might be interested in a wonderful social occasion to take in a great movie. Share the work of preparing food/snacks/drinks so the host of the event isn’t stuck doing all of the work. Consider asking Interactors or Rotaractors to watch the movie and help with the setup and cleanup. Movie night can be pretty easy. Providing popcorn may be all the snacks that are needed for a good time to be had by all. When the time is right (you will know when that is) gather the troops and watch the movie. Afterwards, ask your guests to consider making a small contribution to the Rotary Foundation and Polio Plus. You can have a flyer available DOWNLOAD HERE to give guests the link to the endpolio.org site so they can contribute online. Make sure to follow up with your guests and put them on your club’s newsletter email list. Be sure to invite them to all future social functions for your club. Be certain to send them updates on our progress with polio eradication. Hopefully there will be even more good news throughout the 2018 year. And finally, ask them to be your guest at a club meeting and perhaps consider membership in your club. Contact your local theater owner and ask what it would cost to rent a 100 to 200 seat theater for one night during the week, or whatever the theater owner considers to be a slow time when filling the theater and selling some refreshments would be a benefit to him or her. Sell tickets for an evening movie event where the price of the ticket is enough to pay the theater rental and still have enough profit to raise money for Polio Plus. For example, if the theater rental is expressed as a dollar figure, ie. $1000 to rent a 200 seat theater during a weeknight. If you sell 150 seats for $25 each you would gross $3,750 and net $2,750 for Polio Plus. You choose how much to charge for the tickets depending on how you want to position the event. For example, you could charge $100 per ticket and make the evening more a “black tie” movie premiere. If you sell out a 200-seat theater you can gross $20,000 and net $19,000 for Polio Plus. Have some fun with the premiere. How about renting a red carpet and having a photographer take photographs of everyone entering the theater? Your guests will buy popcorn, beverages, and other food items from the theater. Or it is possible that a theater owner will allow you to make other higher-end arrangements for fancier fare. Connect with your District Leadership if you are inviting a large crowd to learn about Rotary by watching Dare to Dream. Your District Governor, District Foundation Chair, and District Polio Chair, may all be interested in attending and helping to support your effort to promote Rotary, our polio eradication efforts, and your club. Promote the movie to the community, not just to your fellow Rotarians. The object is project our message beyond our membership to potential new members or contributors. 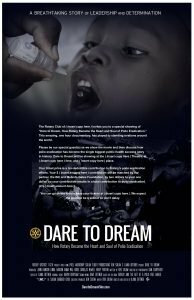 Ask the theater manager if he or she would be willing to display the Dare to Dream movie poster in the lobby of the theater. Download the Dare to Dream movie poster HERE. Ask the local paper and other local media to publish the poster as an advertisement. Use your club’s website and ask members to distribute the movie poster on social media. Ask club members to distribute the poster to their businesses and boards of organizations where they serve as members or trustees. The objective is to fill the theater with people in the community that you would want to join your Rotary club. Make sure to get the contact information of your guests. You can do it at the event by passing around a sheet with names and email addresses, or you can ask members to be sure they have the contact information of your guests. Your club can receive credit for Paul Harris recognition by properly keeping track of ticket sales. Your individual members can receive credit by properly filling out forms allocating contributions by member. Schedule the club program about Rotary and Polio Eradication. Make sure to download the excerpt to a laptop and make arrangements to have a projector or TV and MDI cable available. After watching the FREE excerpt from the film, have a conversation with members about Rotary and polio. To download a guide for facilitating a club discussion about supporting polio eradication, click HERE. Ask club members to purchase their own personal copy of the film. They can easily purchase by going to the Dare to Dream website and clicking on Buy The Film. Members will want to own their own copy to share with friends, family, and colleagues. They will also (of course) want to see the full movie to find out the end of the story and better understand the challenges Rotary faced in deciding to eradicate polio. If members purchase the $25 version of the film hosted by Vimeo, then $18.75 per purchase will be contributed to Polio Plus. If ten members purchase the video that would be $187.50 contributed to the Rotary Foundation. Please note that net film purchase proceeds go to the Rotary District 7620 Project Trust Fund and are then contributed to the Rotary Foundation. We don’t have the ability to give individual purchasers credit towards their Paul Harris Fellow recognition.